God dispatched President Ronald Reagan to beat back the Russian’s communist greed one last time. Obama has failed to threaten Putin and demand he remove his invading neo-Soviet armies from the Ukraine and God has finally lost all patience! Instead of waiting around for 2016, God took immediate action and sent a true American president to terrify the Russians, just like when we scared them with threats of ‘Star Wars’ and American death lasers raining searing beams of light down upon their Godless heads! 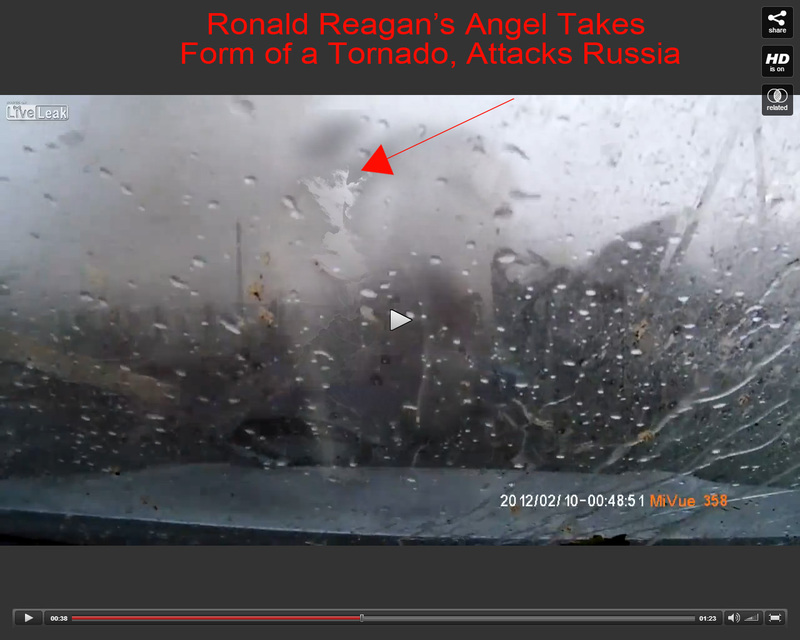 Watch Reagan’s angel tear through this Russian neighborhood in the form of a tornado! Not since President Ronald Reagan and Pope John Paul II joined forces to scare Russia into giving up communism, have the communists seen such a great display of America’s power. Thank you, President Ronald Reagan. Even as an angel in Heaven, you are defending America and protecting not our our Christian nation, but all the other nations worldwide from great threats.